Visit the UNESCO-listed site of Ait Ben Haddou on this day trip from Marrakech. 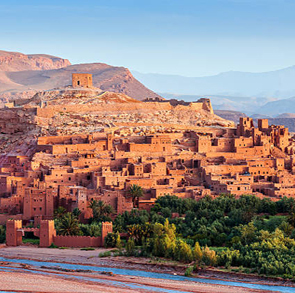 Travel from Marrakech to Ouarzazate by air-conditioned Minibus, and venture into the Atlas Mountains of Morocco and reach the impressive Ait Ben Haddou Kasbah, declared a world heritage site and backdrop of numerous films. At Ouarzazate, Morocco, the door to the Sahara desert, you will visit the ancient Taourirt Kasbah, a Palace of 300 rooms, and the famous Atlas Film Studios. We will begin our full-Day Tour from Marrakech to Ait Benhaddou and Ouarzazate at 8 am, travelling in the direction of Ouarzazate. Along the way, enjoy the spectacular views that the valleys of the area provide, and visit Berber villages engaged in the sale of semi-precious stones. As we move southwards, the mountainous landscape transforms into semi-desert. In this area we will visit the famous Kasbah, and discover typical small houses constructed with mud and straw. Arriving at Ouarzazate, we will visit the former residence of the Pacha El Glaoui, the Taourirt kasbah, and the kasbah of Ait Ben Haddou, declared a UNESCO World Heritage Site, and one of the best preserved fortified cities the country.Its unique architecture and environment has made it the ideal filming choice for many film and series production filming. Some of the movies and TV shows in which we have viewed this fantastic kasbah include Gladiator, Kingdom of Heaven, Babel, Prince of Persia, The Mummy, and, of course, Game of Thrones (it is the city that Daenerys Targaryan releases in the last chapter of the 3rd season). Also, to complement this Marrakech to Ait Ben Haddou tour, we will visit the Atlas Films Studios, where many scenes of the movies mentioned have been recorded. 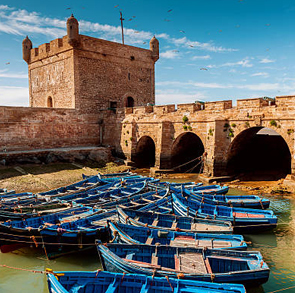 Thus, we will have the opportunity to discover the cinematic importance of this area of the country.Entry to the kasbah is free, but if you want to explore it with a guide, you must pay them separately at the time (about € 2 per person). Travel from Marrakech to Ouarzazate for an exciting full day trip! Discover the beautiful Kasbah of Aït Benhaddou and the Atlas Films Studios with a professional guide!